Should I get my silver mercury fillings removed? The short answer is: Maybe. A slightly longer answer is: We recommend replacement with white fillings when indicated. The long answer is addressed below. 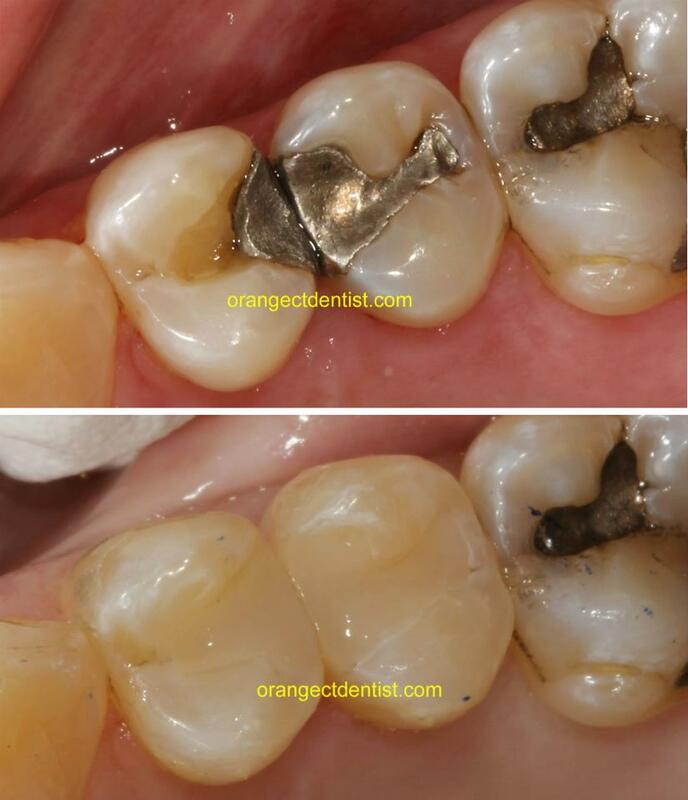 This is a before and after photograph showing silver amalgam filling replacement in our office. Replacement of 2 silver amalgam fillings. Note the break in the silver filling on one of the teeth. This patient resided in Woodbridge, CT. Dental procedure and photo by Dr. Nicholas Calcaterra. You will note that there were three silver fillings present in the first photo. Two of the silvery mercury fillings were removed and replaced with white fillings. 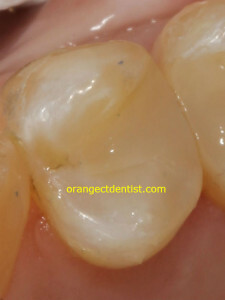 This was done because one of the silver fillings had broken and the other one had decay (cavities) underneath. The third one was not replaced. The third one is dark and old but there was no decay visible decay underneath. We’ve had several patients all over the greater New Haven area, including West Haven and Ansonia, who have had silver fillings removed due to breakage. Should I have my silver fillings removed? A “silver” or “mercury” filling is referring to dental amalgam. Dental amalgam comes as a combination of various metals (silver, tin, copper, and others) and liquid mercury. The components are mixed while a patient is in the chair, the mixture is placed in the tooth, and within hours it hardens into a durable and effective filling material. Mercury remains in the filling for the entire time the filling is within your tooth. Scientists all agree that some amount of mercury leaks from the filling over time. Despite claims by certain media members, at the current time (May 2013), there are no credible, peer-reviewed studies that link silver fillings to any medical problem. Despite claims by certain media members, at the current time (May 2013), there are no credible, peer-reviewed studies which show that the removal of silver fillings cures or remedies any medical problem. Click on the photo to learn about white fillings. Based upon the above facts, and this statement by the American Dental Association, we do not recommend the removal of silver mercury fillings in our Orange, CT dental practice for medical reasons. However, if a patient comes to us asking for removal, as long as they are aware of the facts (this is called informed consent), we will usually perform the procedure. We will recommend removal of silver amalgam fillings and replacement with either white fillings or crowns when we see cracks, decay (cavities), chipping, or other problems. And if a patient has an esthetic concern with the silver color, we will replace them. Call our office at (203) 799 – 2929 or visit this page to request a consultation regarding your silver fillings.